It's easy to learn, and gets immediate results! Are you frustrated with your game? Do you feel like you've tried everything and your game just doesn't improve? Are you fighting the YIPS? Are you looking for long lasting solutions for your golf game but haven’t found any? The Moxie Golf Process will bring hope and help! Lessons and 2-3 Day Golf Schools are available upon request in Minnesota during the Golf Season. Call Barb at 952-807-4621 for scheduling dates, times, and pricing. The Moxie Golf Process is the brain child of Barbara Moxness, LPGA and Legends Tour Professional and a Golf Digest Top Teacher. The Moxie Golf Process helps golfers rediscover their God-given athletic ability -- instead of focusing on swing mechanics -- by offering simple, easy to learn solutions to golfers experiencing all sorts of obstacles. Most students see immediate results! The success stories are amazing! ...I couldn’t believe how easy Barb made the golf swing seem. I felt like I had been set free! 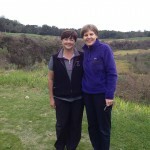 When we played 9 holes after lunch together she watched and gave advice on every shot I made and helped me with club selection and course management..."
Continue reading "A Student’s Perspective on the Moxie Golf Academy Experience"
I understand what causes the YIPS and I know how to help you manage them or even find a cure. There is HOPE! Learn simple principles that address the physical, psychological and spiritual aspects of golf that help you advance in your golfing experience and find greater enjoyment. You will also find solutions for those recurring nightmare golf shots and gain confidence. You will enjoy lasting success both on and off the golf course. It’s all in my book Golf From the Inside Out. If you are changing to a short putter or want to keep using your long or belly putter, download my complimentary eBook "Transition from the Anchored Putter" on how to make the transition easy and comply with new USGA rules. Joyce P: Barb’s teaching style and knowledge are extraordinary. The Moxie Golf Experience helped me realize we all have our own style. I take with me control, encouragement and de-cluttering my golf game. Manage Your Yips For Good! 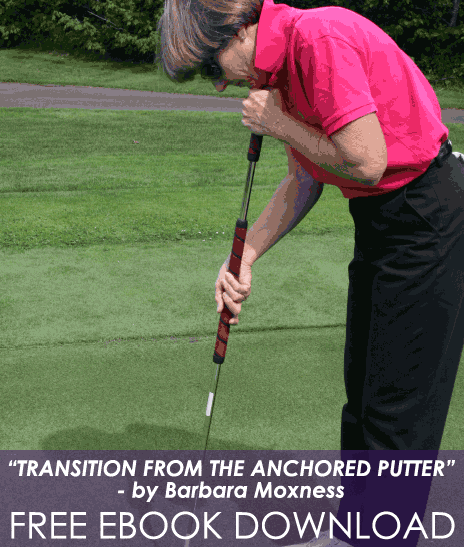 Order complete Instructional Video and eBook: "Managing and Curing the YIPS Permanently"
This short document by Barbara Moxness highlights what will be allowed in 2016 for anchored putting and a short writing outlining some principles to transition to anchorless putting. Join our mailing list and receive this FREE DOWNLOAD! Subscribe to our email list to receive updates!